I’m not just a shopper. I’m a black-belt retail ninja. And when I’m traveling the Caribbean, no craft store, no art gallery, no roadside souvenir stand can escape my eagle eye and poised credit card. I’ve even been known to take advantage of a shopportunity via beachfront Wi-Fi. So it’ll come as no surprise when I tell you that I amassed quite the collection of souvenirs last year. And now I’m sharing some of my favorites. To all you travelers out there who collect destination-branded shot glasses, baseball caps and fridge magnets, I have one word: Stop. Instead, why not start collecting charms for a travel-themed bracelet or chain? My own charm bracelet is laden with more than 30 danglers from all over the Caribbean, and this year I added a flipper from Bonaire; turquoise totem from Guadeloupe; an ackee from Jamaica; and a sailors’ knot from St. Croix. Charms are collectible, cute, compact and, if you choose get them in silver, absolutely affordable. Score! Artist Georgie Tuson paints hollowed-out Caribbean gourds with vivid abstract patterns and island landscapes. I scored this one, now mounted in my office, at Atelier Turquoise on Union Island in the Grenadines. It’s a piece of Paradise that takes me back there every time I look at it. 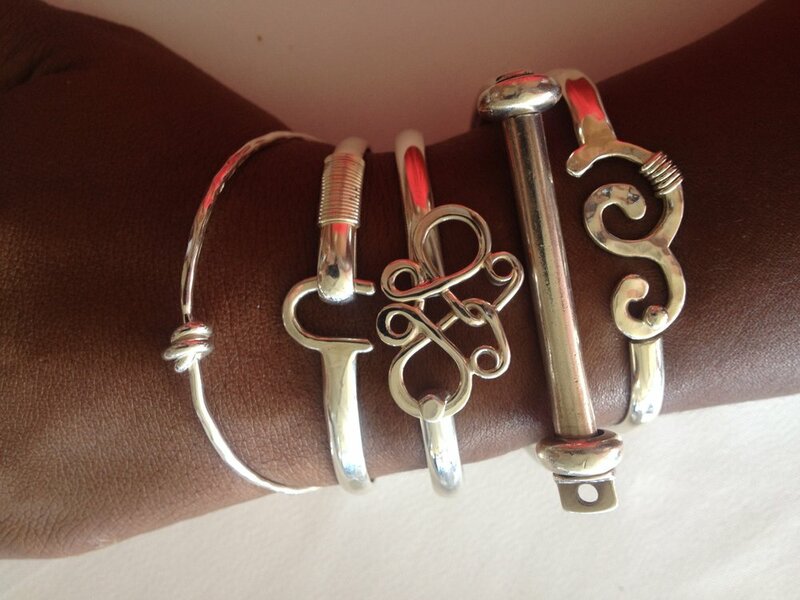 The hook bracelet is iconic in the U.S. Virgin Islands, particularly in St. Croix where a Christiansted jewelry store called Sonya’s is the originator of the traditional 50-year-old design, available in silver, gold or a combination of both metals. I opted for the silver classic at Sonya’s (far right in the photo) and then crossed Company Street to snag a version called The Wave (far left) at IB Designs. And by the time I left St. Croix four days later, I had yet another hook bracelet to add to my wrist stack, the whimsical butterfly design from Crucian Gold. Because there ain’t no party like an arm party, y’all. Before my first trip to Guadeloupe last spring I became obsessed with finding a salako, a traditional hat worn by fishermen from Les Saintes, two of the islands in the five-island archipelago. After an exhaustive search I ended up finding not one but two. I don’t actually wear them (fishing’s not really my thing) but they look great mounted on the wall in the kitchen, where they lend color and French-Caribbean flair. I live in Miami so the guayabera ­–­ a pin-tucked cotton or linen shirt popular in Latin and America and the Spanish-speaking Caribbean – is something I often see worn by Cuban gents-about-town. But I never wanted one of my own until I went to Mexico and saw them stylishly sported by women at Grand Residences, the Puerto Morelos resort where I stayed. This one, hecho en Mexico by Abito and available in the resort’s gift shop, is cool, comfortable and looks best when lightly starched and worn with the collar popped (‘cos I’m stylish like that).